To test a 3D-hindfoot alignment (HA) measurement technique based on low-dose biplanar radiographs (BPRs) in a clinical setting and compare the results with 2D-HA measurements on long axial view radiographs (LARs). This prospective study was approved by the local institutional review board. HA measurements on 3D-BPR and 2D-LAR of 50 patients (29 female; mean age 47 ± 16.6 years) were compared (positive values = valgus; negative values = varus). 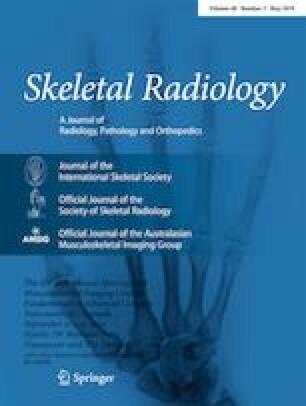 Two independent musculoskeletal radiologists (readers 1 and 2) performed 3D-HA measurements on BPR using a custom-made MATLAB code and measured HA on LAR during two separate readout sessions. Descriptive statistics and intraclass correlation coefficients (ICC) were calculated, and Bland–Altman plots were used for intermethod comparison. Using BPRs, HA was 0.8° ± 9.°1 (range, −20.2 to 20.0) for reader 1, and 0.7° ± 9.5° (range, −21.2 to 18.3) for reader 2. HA on LARs was −2.0 ° ± 7.0° (range, −27.0° to 11.1°) for reader 1 and − 1.7° ± 7.0° (range, −24.1° to 14.3°) for reader 2. Interreader agreement for measurements was excellent, both for BPRs (ICC = 0.992; 95% CI:0.986–0.995) and LAR measurements (ICC = 0.962; 95% CI:0.932–0.978). Mean difference between the two methods was −2.43° (range, −29.4° to 25.6°) for reader 1 and −2.6° (range,-28.7° to 30.2°) for reader 2. On Bland–Altman plots, three measurements of reader 1 and six measurements of reader 2 were outside of the ±1.96 SD interval. Hindfoot alignment measurements on 3D-BPR have an excellent interreader agreement in a clinical setting. Large measurement errors can occur in individual patients using 2D-LAR alone. Therefore, we suggest using 3D-BPR measurements in daily routine for the assessment of HA, which are independent of rotational foot malpositioning. The authors declare that they have no conflicts of interest. The authors did not receive any financial benefits from EOS.